The U.S. Army Tank Automotive Research, Development, and Engineering Center has partnered with the Joint IED Defeat Organization (JIEDDO), and the Army Capabilities Integration Center (ARCIC) to host the Robotics Rodeo III at the Maneuver Battle Lab at Ft. Benning, GA June 20-29, 2012. Vignette #1 Corral - "Setup, Deploy, and Relocate": The robot must autonomously establish a hasty prone fighting position on a section of a combat outpost perimeter based on locations provided by an operator. Vignette #2 Gunslinger - "Protect": The robot must identify and alert the operator of hostile activity within a defined area, and then acquire and track those moving targets. Vignette #3 Wagon Train - "Sustain": The robot must autonomously navigate to multiple designated locations and autonomously unload materiel in a specified order upon arrival. 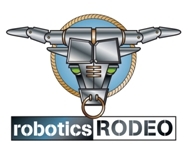 For more details on the Robotics Rodeo, or for information on how to submit Info Papers or Demonstration Videos, please go to: http://www.tardec.info/roboticsrodeo.